This illustration explores various political discourses regarding animal-human relations. With regard to the sculptural elements, I hoped to take ideological principles underpinning the “organic approximation” sculptural series and apply them to my painting and drawing work. Specifically, I was interested in playing with the concept of the traditional relationship of the frame--which is very often derived from natural, living materials--and the artwork it frames. In this piece, I thought of the natural elements of the wood frame being restored to life, and literally growing away from the artwork, thereby stifling its formal usefulness. I was also interested in the discord that developed between the 2-D and 3-D elements. I was interested in ethical and ontological questions related to the intersection of Abrahamic religions, anthropocentrism, and environmental ethics and philosophy. 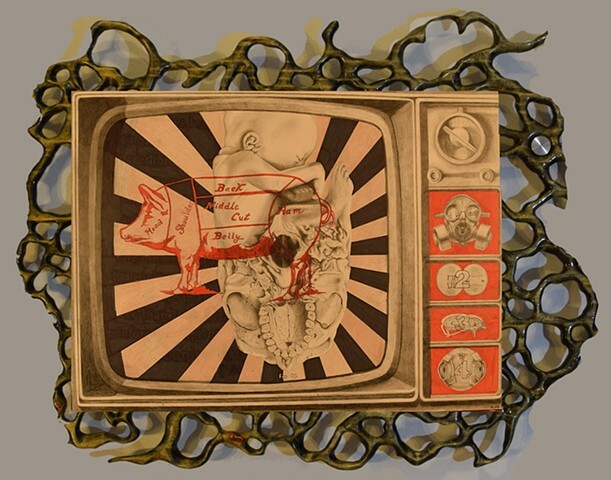 In making this piece, I was initially provoked by the intersection of public discourses surrounding the environmental stressors of animal husbandry; the apparent avoidance of this issue by government, media and even environmental advocacy groups; and prevailing ethical semantics surrounding meat-eating. I was trying to objectively understand the powerful rational forces behind the popular position of human ethical superiority. I wondered what logical constructs might predispose humans to anthropocentric beliefs; what the possible origins of these beliefs might be, and how these beliefs have shaped and continue to shape human behavior, public policy and even law. Fig. 83 is my way of communicating what is to me the fallacious nature of this ethical position. For a perspective on source materials affecting my thinking on this issue, see: Peter Singer’s Animal Liberation, 2) Cowspiracy: The Sustainability Secret, and 3) Wall Street Journal’s WSJ2050, “How to Satisfy the World’s Surging Appetite for Meat”.